Happy Birthday to Ricardo Liborio! Today may be an “unlucky” day according to superstition, but this particular Friday the 13th is also a day for celebration – it’s the birthday of Brazilian jiu-jitsu legend Master Ricardo Liborio! Many of us in the martial arts community know Liborio for his amazing record in BJJ. He won the inaugural World Jiu-Jitsu Championship (or Mundials) in 1996, despite competing against a much heavier opponent. He was named “Most Technical Black Belt” at the same tournament. He co-founded the Brazilian Top Team, and later, the American Top Team, both legendary MMA gyms. 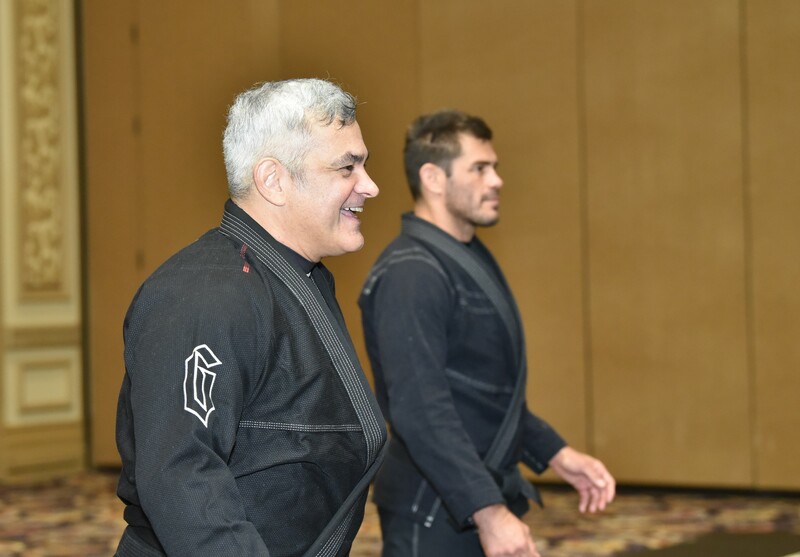 (left to right) Bruno Malficine, Ricardo Liborio, and Marcelo Garcia at the 2018 Martial Arts SuperShow. Liborio has the humble spirit that you see in many of the greatest martial artists. When he talks about BJJ or martial arts, even if it ties in to his accomplishments, it’s never prideful. You can hear the sheer enthusiasm for, and love of, the arts in his voice. Ricardo Liborio with his daughter, Bella. As a baby, Bella developed craniosynostosis which caused her to lose her sight. In response, her father founded a community outreach program to teach grappling to the blind and visually impaired. I could write an entire blog on the remarkable things Liborio has accomplished in his career. However, simply mentioning his achievements doesn’t do him justice. Working at Century, I’ve had the opportunity to meet Mr. Liborio in person. I’m sure all of my coworkers – and anyone else who’s met him – would agree that he is simply one of the friendliest, kindest people on the planet. In short, he might be an incredible martial artist, but he’s an even more wonderful human. So, from all of us at Century, Happy Birthday, Master Libo!